Sweet. Simple. A touch of whimsy. 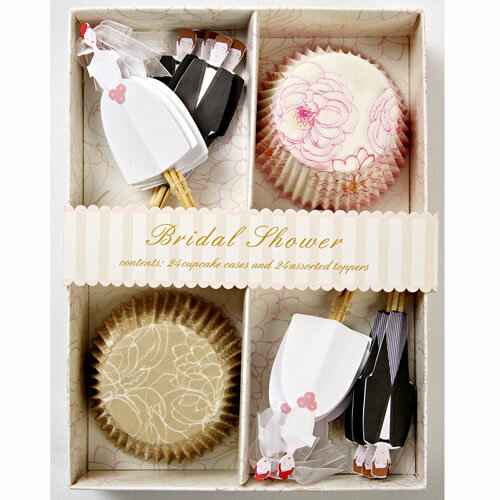 These lovely cupcake paper and pick sets are from award winning designers Meri Meri. At Fancy Flours we currently carry 12 of their cupcake set designs from “Circus” and “Cute Kitten” Themes to “Princess,” “Fire Truck” and “Oh Baby Baby” (featured above). Each set comes with 24 cupcake liners and 24 picks to top your scrumptious cakes! Bake up your favorite recipe for cupcakes, bake in these adorable liners, frost with a delightful frosting recipe, and place a pick in each – voila! A masterpiece in no time thanks to your baking skills and the clever folks at Meri Meri. Set are $18.00 a piece and are available at fancyflours.com. Check out the other fun things at Meri Meri – this company has CUTE figured out! From party invitations to holiday cards and decorations there is all kinds of fun to be had on their site, www.merimeri.com. Shop fancyflours.com for all your baking and decorating needs. This entry was posted in Cupcake Recipes & Ideas and tagged baby, ballerina, bridal shower, circus, cupcake set, cupcakes, fancy flours, fire truck, kitten, meri meri by Fancy Flours. Bookmark the permalink. I just love these kits, the detail is fabulous and they make any occasion a hit! Also great for a gift with one of FF’s baking mixes! Will be buying some more for sure! Thanks so much for on line buying and quick overseas postage!